Please enter your user details. Purchase premium Bourbon-Madagascar vanilla powder for the best prices. 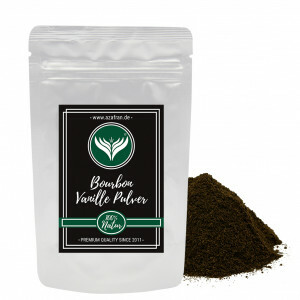 True Bourbon vanilla powder comes packed in 100 grams bags. Our delicious bourbon vanilla comes from Madagascar and is one of the world's most well-known vanilla extracts. This vanilla got its name from the Isle of Bourbon, which is now known as Réunion. The flavour is noted for its elegance and balance while still providing a uniquely intense flavour. This type of vanilla is best for sweet desserts like puddings and creams. You can also use it to enhance dishes that call for a balanced sweetness like lobster, salmon, white meat and other types of fish. 2.1 Depending on the size of your order it will be shipped by DHL or any other company of our choice. 2.2 We ship to the following countries: Germany, within the EU, Norway and Switzerland. For each of the shipping costs, see sections 3.1 and 3.3. 3.2 Please note that other taxes may arise in cross-border deliveries (such as in the case of an intra-Community acquisitiion) and/or levies in the form of tariffs which are to be borne by you. 4.1 The delivery time is 1-3 working days within Germany. No delivery during Saturdays or Sundays and during public holidays. If an item is not in stock or not immediately delivered within the delivery time, there is a one-day extension, it is pointed out in the product page. 4.2 For international shipping, delivery time is approximately 5-7 business days. No delivery during Saturdays or Sundays and during public holidays. If an item is not extended once, in stock or not immediately delivered withinthe delivery time accordingly, it is pointed out in the product page. Premium taste - affordable experience! Brand quality - clean, fair and honest. * For delivery in EU, CH and NO. Your security is important for us!